The Great Latgalian Fair was first organized in 2009, on the 20th and 21st of June, at the old fortification ruins in Ludza. In preparation for the summer solstice, for two days a cozy and festive atmosphere prevailed at this beautiful event. There, the major artisans of Latgale organized live workshops demonstrating their skills and offering buyers their crafts. The farmers offered visitors a festive rural table, the blooming wild flowers smelled nicely, songs were sung, the organizers offered a variety of games, horseback-riding, pigeon concerts, animal petting and many different treats. Everyone, both young and old, enjoyed themselves. For the first time on that spot, a kiln was heated and finished ceramics were removed on the following day. 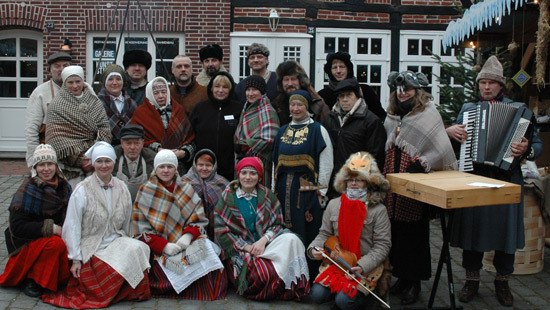 The event was organized by the association "Ludza’s Craftsman", in collaboration with the Latgale Arts and Crafts Centre, the congregation of the Catholic Church of Ludza, Ludza’s City Council and the Latgale Regional Development Agency’s Cultural Program and the Latvian Cultural Capital Foundation. Travelers on the “Way of Golden Hands” were also invited to spend the midsummer days in Latgale. This year, 2010, the Great Latgalian Fair was held from the 19th to the 20th of June at Ludza’s old fortifications. Again, we invite all artisans to come to demonstrate skills, to heat the kiln, to play, sing, dance, taste beer, cheese, dumplings, soup and other tasty treats. Next year , 2011, the Great Latgalian Fair will be held from the 18th to the 19 th of June at Ludza’s old fortifications again. We will invite some more artisans from other countries, and will organize more ancient shows!